The hottest days of summer are upon us with temperatures in the 90’s with heat indexes above 100. While some may find it too hot to work in the garden right now, you can put the climbing temperatures to use and solarize your garden. Effective solarization takes 4 to 6 weeks, so start now to get your garden ready for fall planting. Looking for a way to manage soil pests in your vegetable garden without using chemicals? Soil solarization is a technique that uses the sun’s energy to battle pests and diseases in your soil. It’s especially effective against nematodes, tiny worms that feed on the roots of plants. If you decide soil solarization is something you’d like to try, it’s important to understand how the process works. 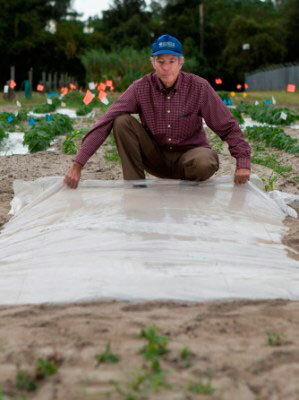 A sheet of plastic is used to cover the soil surface for six to eight weeks. Clear plastic is used so that sunlight is able to pass through it. The soil warms and the plastic traps the heat allowing the soil to reach temperatures that are lethal to many pests and weeds. When done effectively, soil solarization can reduce pest populations for three to four months, and in some cases even longer. To prepare your site for solarization, you’ll want to clear the area of weeds and debris and incorporate any soil amendments that you plan to add. You can till into the top six inches of soil to help increase heat penetration, although this isn’t necessary. Rake the area smooth, making sure the space “crowns” in the center so that rainwater won’t collect on the plastic and cool the soil. If your solarization has been successful, you should see a reduction in weeds and soil pests for the next three to four months—long enough to grow a fall garden! If you need help regarding your landscaping, we at Garden Services are fully licensed & insured to handle all your irrigation, landscaping, lawn maintenance and tree service needs whether it’s a residential, commercial landscaping or homeowner association property. If you ever have any comments or questions, please don’t hesitate to call or email me and I’ll be happy to answer any questions that you might have. Special thanks to UF/IFAS extension for some helpful information provided in this post. Until next month Happy Gardening!